As you age, stumbling blocks are everywhere: the bottom step, the roadside curb, and even the living room carpet. But you don’t have to live in fear of falling. 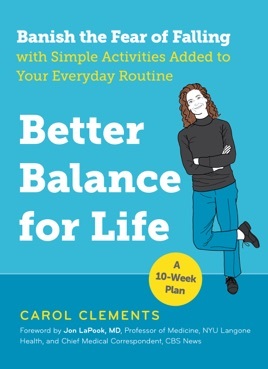 With Better Balance for Life, you will learn all-new, simple activities to help you build strength and increase flexibility to improve your balance! In this ten-week program, personal trainer Carol Clements shows you effortless moves to slide into your everyday routine. Already brushing your teeth? Try standing on one foot while touching the counter to build stability.Watching TV? Learn how to extend your toes and flex your ankle to develop more nimble feet—and greater mobility. With four new activities each week, building better balance is fun and easy. By the end, you, too, will be marching with your eyes closed!